The E-Journal’s coverage of the 4th AGA Pro Qualification Tournament — this week in Los Angeles — has been expanded to include brief video game highlights focusing on key points in selected games. 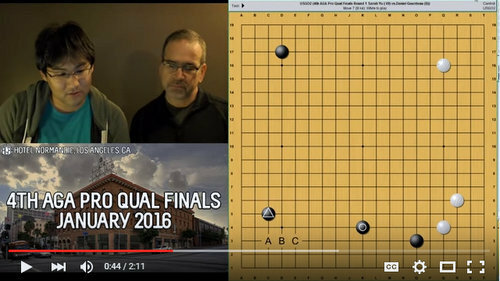 In our first batch, Tyler Oyakawa 5d provides a 2-minute review of the main ways to approach the 3-5 point in the Round 1 game between Sarah Yu and Daniel Gourdeau (right). “Nice comparison,” says Dontbtme. In his review of the Round 1 Andrew Lu-Aaron Ye game (4:10), Oyakawa explains how to manage an attack on weak groups, and in the Manuel Velasco-Jeremy Chiu first-round game (5:10), he looks at options for handling your opponent’s moyo, including when to reduce and when (and how) to invade. Finally, Oyakawa provides a brief explanation of Ben Lockhart’s fast opening moves against Andrew Lu in their Round 2 game (2:00). “Check them out and let us know what you think!” urges EJ Managing Editor Chris Garlock.